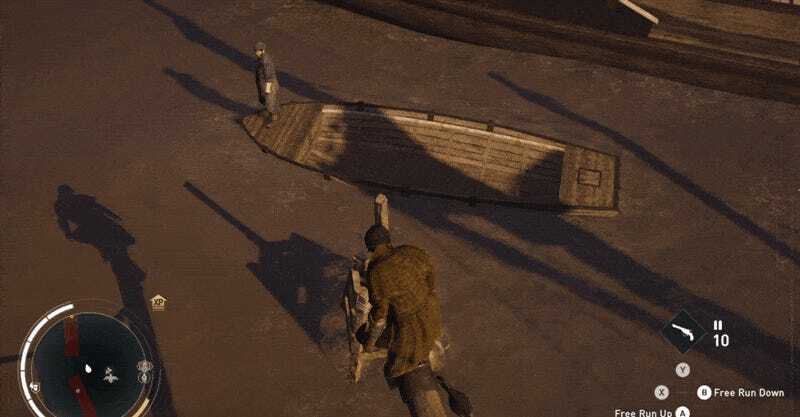 In Assassin’s Creed Syndicate, there’s a guy whose entire job is to stand on a boat and get knocked into a river. That’s it. That’s his whole life. If you’re running along in Syndicate’s version of London and happen to cross the Thames, you’ll probably see this guy. He’s all over the place, so if you’re on the river, chances are he’s nearby. He’ll be standing there on the edge of a rowboat, maybe having a cigarette or something. Then you’ll run past him, since this is an Assassin’s Creed game, and it’s mostly about running past people. Sploosh! Down he goes. You jog on, focused on whatever thing on your minimap it was that had you running across the Thames to begin with. He goes into the water, clothes and all, and never actually resurfaces. Does he die? Can he just hold his breath for a really long time? What kinds of bacteria are in the Thames, anyway? We will never get answers to these questions. I salute you, Assassin’s Creed Guy Who Falls In The River. You exist entirely for the sake of a single pratfall; you suffer for our pleasure. You may not think anyone notices how hard you work, but I do. I notice you.